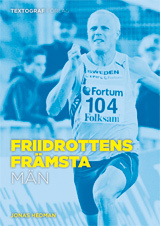 The book ”Sweden’s Top Athletes in Track and Field” (”Friidrottens främsta män”) is a unique biography in which 19 of Swedens best male athletes are portraited in text, pictures and stats in a way that has never been done before. I the book they talk about how they grew up, the first connection with the sport, the big moments, the adversites and the training who made them number 1. Read about the 200 and 400 m runner Johan Wissman, triple jumper Christian Olsson, steeplechaser Anders Gärderud, high jumper Patrik Sjöberg, pole vaulter Kjell Isaksson, discus thrower Ricky Bruch, long jumper Mattias Sunneborn and many others. The choice of names are based on a never before published ranking in which the top-5 Swedish male athletes of all time in all championship events are judged. They are ranked from the perspective of number of championship medals, records and result level. A total of more than 90 athletes are listed in the 20 events. Who is the best Swedish 5000 m runner of all time? Did Johan Wissman get the number one spot at 200 m? And who is the king of decathlon? ”Sweden’s Top Athletes in Track and Field” is a biography book but also describe the enormous development of the sport during 100 years. From cinder track, starting-holes and hand-timing to synthetic tracks, starting-blocks and electronic timing. From the javelin thrower Eric Lemming, who in the beginning of the 19th century contributed a lot to the organisational development of athletics, to Christian Olsson who is competing in a totally different time age where it’s possible to earn one’s living on the sport. The book about the best Swedish track and field athletes include several never before published stats such as result progression, championship awards and compilations of the 25 best meets for each athlete. Did you know that former world record holder Kjell Isaksson competed in more than 600 pole vault meets? And that he cleared five meteres or more in 418 of them? The 19 chapters are complemented with a index which includes more than 700 names. The author Jonas Hedman (born 1972) is one of the most distinguished Swedish track and field experts. He is editor of the Swedish track and field magazine Friidrottaren (which started in 2006) and contributes to several publications and web sites on a regular basis, among others www.friidrott.se. Jonas has also been published in Track&Field News, www.iaaf.org and www.european-athletics.org. ”Sweden’s Top Athletes in Track and Field” is his fourth book. 432 pages, 170*240 mm, 160 pictures, hard cover. $80 (582 SEK) outside Europe (including postage and shipping). EUR 57 (550 SEK) within Europe (including postage and shipping). EUR 40 (383 SEK) within Sweden (including postage and shipping). Or call: ++46 709 99 51 04 (Jonas Hedman). Swedish All Time Lists for Men by Bengt Holmberg. The book about the Swedish Athletics Championships by Erik Wiger.